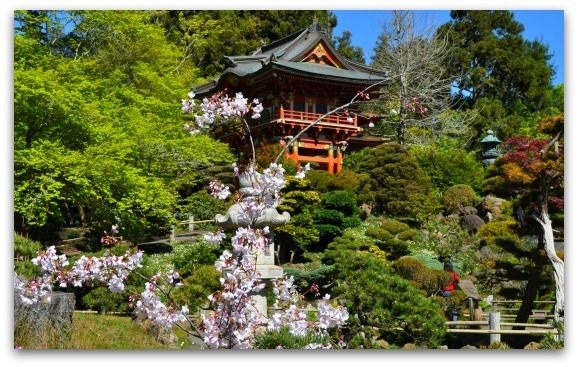 The Japanese Tea Garden San Francisco is a beautiful and relaxing setting on the eastern side of Golden Gate Park. It's the oldest Japanese Tea Garden in the United States. It's open for visitors 365 days a year. Inside, you will find beautiful blooming flowers, a gorgeous drum bridge, a historic pagoda, a zen garden and so much more. You can also spend some extra time enjoying a tea or a meal in the on-site teahouse. 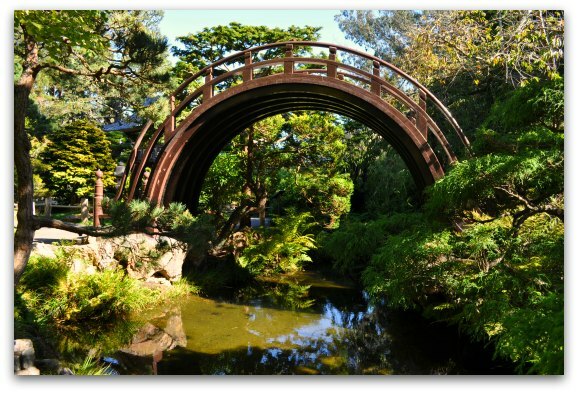 Once you enter the Japanese Tea Garden San Francisco, you'll see trails that lead in several directions. All of the trails weave through and circle around the park - so each one will take you by its many attractions. 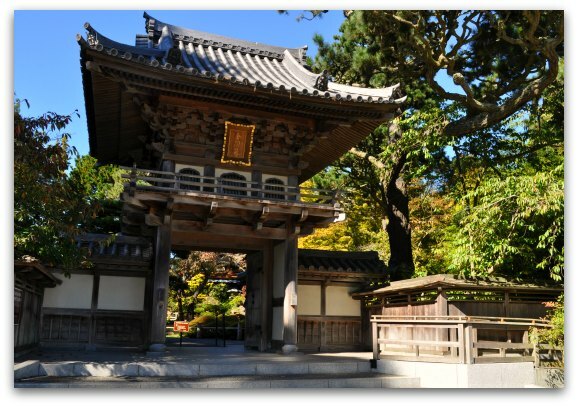 Here are a few of my favorite things to see and additional tips for visiting the Japanese Tea Garden San Francisco. It was originally built in 1894 for the California Midwinter International Exposition. After the exposition, Makoto Hagiwara, a Japanese immigrant, continued to care for and expand the garden. Over the years, many landscape architects and others added to and cared for it. Today, it covers more than five acres of land. Before you even enter, you'll see its first masterpiece - the entrance gate. This gate sits at the location where the original gate was built in 1894. The first gate fell into disrepair, so the city of San Francisco completed this new gate in 1985. The high arching drum bridge is part of one of the trails. It has wooden planks that allow you to climb up and over it. Many people love to take their picture on top with the beautiful trees in the background. If you prefer not to climb over, you can also hop on another trail and walk around either side. 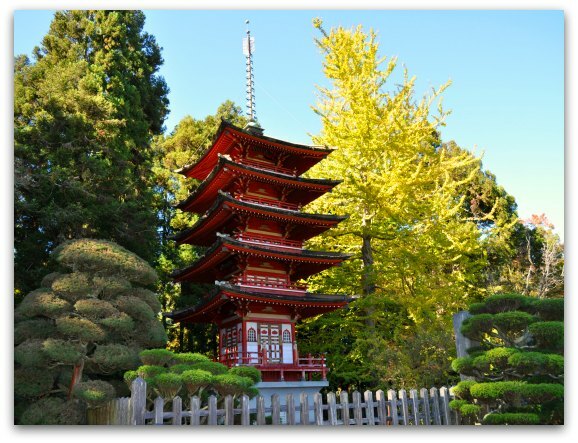 This five story Pagoda is another one of my favorite attractions in the Japanese Tea Garden San Francisco. It was originally built for the Japanese Exhibit at the Panama-Pacific Exposition of 1915 in San Francisco. It was moved here shortly after the exposition ended. The Dwarf Tree Collection sits on Waterfall Hill. This tree collection was privately owned for many years. The park received it and moved it here in 1965. You will see several varieties planted on the hill. Each has an unusual shapes was created using specialized training techniques developed by the Japanese over several decades. 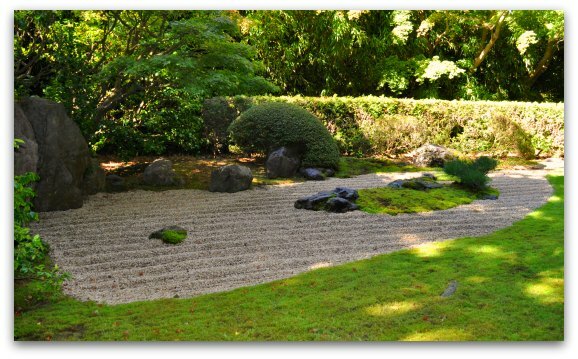 This relaxing Zen garden was added to the Japanese Tea Garden San Francisco in 1953. These types of places were originally created with a religious or mythological meaning in mind. They were designed to help aid those on the search for enlightenment. While you can't enter it, there are several benches and places to enjoy it along the walking path. I love ending my visits to the Japanese Tea Garden San Francisco at the Jack Hirose Teahouse. The teahouse sits right in the heart of it and is the perfect place to continue to soak in its beauty. Here you can have some lunch or just enjoy a beverage. The one in the picture above is a Green Tea Latte - my favorite item on their menu. Additional items you will find on their menu include a variety of teas, Matcha, tea sandwiches, miso soup, green tea cheese cake, and edamame. All of the menu items are less than $10 and many are less than $5 each. Every Wednesday and Friday, the teahouse hosts three Authentic Japanese Tea Ceremonies. They are given by an expert and are by reservation only. The cost is $25 per person. You can contact them directly at 415.752.1171 to reserve a spot. This SF gem is beautiful all year long. If you are lucky enough to visit during March or April - you will see it at the most beautiful time - when the cherry blossoms are in full bloom! 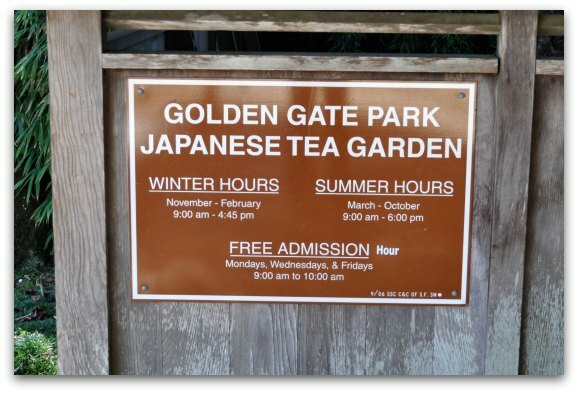 The Japanese Tea Garden San Francisco is open every day - and does not have any holiday closures. From November to February, you can visit between 9am to 4:45pm. From March to October, you can visit anytime between 9am to 6pm. You can also look around free every Monday, Wednesday and Friday morning if you arrive between 9am to 10am. 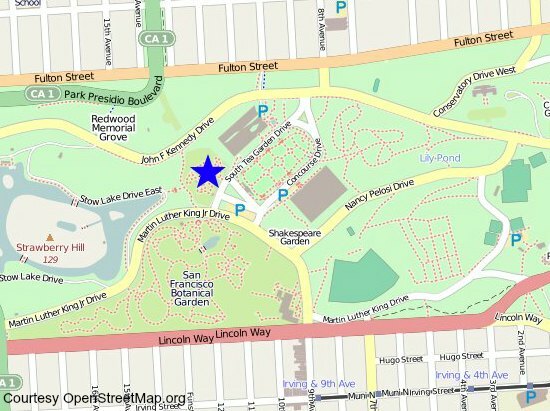 Here is a map of its location within Golden Gate Park. 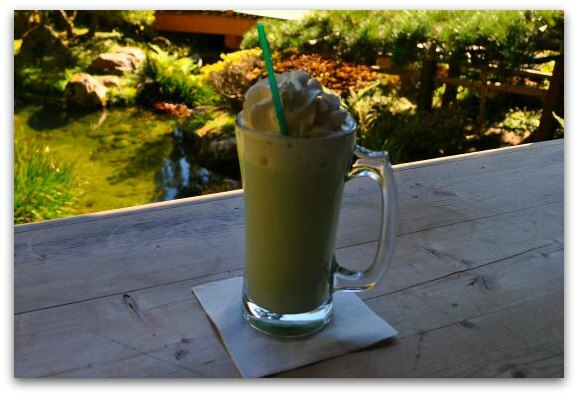 It's right on Hagiwara Tea Garden Drive - just steps from the Academy of Sciences and the deYoung Museum. 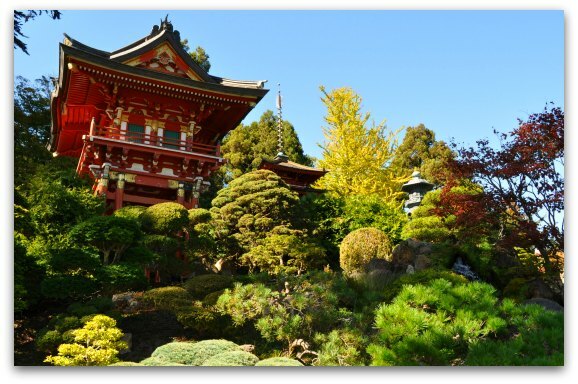 The Japanese Tea Garden does not officially offer tours, but you can visit on a tour with the SF City Guides. Their tour is free and is offered daily at 1pm. They also offer it at 9:30am on Monday, Wednesday and Friday. Even though the tour is free, you must pay for admission for all of the tours starting at 1pm. Admission is free for the 9:30am tours. The three best ways to get here are by taking public transportation, driving or taking the Hop On/Hop Off Bus Tour. Public Transit: The two best options on public transit are either the N-Judah light rail train or the 5-Fulton Bus. Both have stops just a few blocks from the tea garden entrance. Hop On/Hop Off Tour: Another great option is the Hop On/Hop Off bus tour. This bus has a stop right outside the California Academy of Sciences - which is about a block away from the Japanese Tea Garden San Francisco entrance. Learn more about all the stops and pricing details for the Hop On/Hop Off Bus Tour. A visit to Golden Gate Park and the Japanese Tea Gardens San Francisco is one of the few times I will recommend driving. It's easy to get to by car with plenty of parking options nearby. Street Parking: If you are visiting during the week, you should be able to find parking two to three blocks away. Two of the best places to look are on John F. Kennedy Drive and Martin Luther King Dr. Both options offer parking for a limited time. Music Concourse Parking Garage: You will also find a parking garage under the Music Concourse between the California Academy of Sciences and the de Young Fine Arts Museum. The garage is open until 7pm and sometimes later for events. It's $5 an hour during the week and $6 an hour on the weekends. You enter at 10th Avenue and Fulton. Golden Gate Park Segway Tour: One of the best ways to learn more about all the attractions in Golden Gate Park is on this three hour Segway Tour. I had a chance to go on it recently and it was a BLAST! We started with a training session and, once everyone was comfortable on their Segway, we took off to cruise through the eastern end of the park. It's a fun way to learn more about Golden Gate Park and try something a little different too! 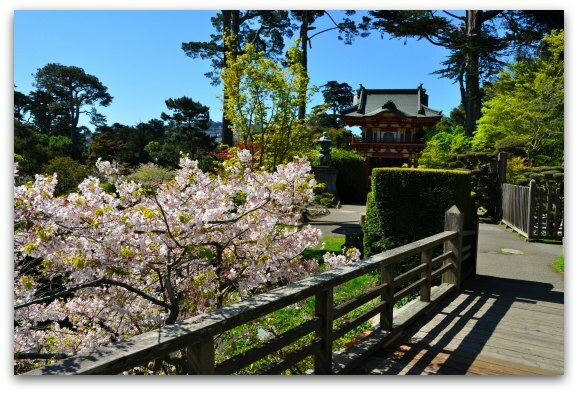 Botanical Garden: Right next to the Japanese Tea Garden San Francisco, you will find SF's Botanical Garden. This 55 acre attraction houses more than 55,000 plants and flowers from around the world. It's one of my favorite places to visit in Golden Gate Park! Stow Lake: Behind the Japanese Tea Garden San Francisco, you will find Stow Lake. At this man made lake, you can do a little hiking, visit the Chinese Pavilion or take one of their paddle boats out for a spin. Beach & Park Chalet: On the western side of Golden Gate Park, you will find the Beach and Park Chalet restaurants. Both offer a fun selection of New American meals as well as their own beers. You can watch the ocean from Beach Chalet or opt for something a little more casual at the Park Chalet at ground level.